Nobody wants to see their house or business premises go up in flames. This is why there are very strict Regulations when it comes to fire safety and protection against fire in any building in South Africa. adequate means of access, and equipment for detecting, fighting, controlling and extinguishing such fire, is provided. 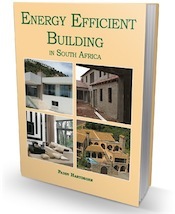 The requirements of the Act will be deemed to have been satisfied if the design, construction and equipment of buildings complies with SANS 10400 Part T and satisfies the local authority. The Act also specifies several offences that owners of buildings need to avoid, including the need for fire extinguishers that comply with SANS 10105. Also, if people do anything to obstruct escape routes in buildings, they will be guilty of an offense. 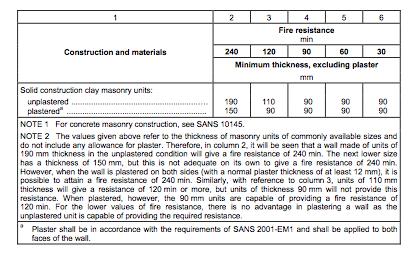 The regulations for Fire Protection are contained in a 91 page document published by the SABS, SANS 10400: Part T Fire Protection. Much of the information is the same as that published in the 1990 version of the Standard that you can download from this site. The bulk of the Standard is made up of a vast number of different “requirements” that relate not only to dwelling houses, but to every other possible type of building, from hospitals to parking garages. health care facilities (this is also completely new). Although there are other provisions, including the classification of the type of external wall, the table below may be used to establish safety distances where walls do not contain windows or other openings. 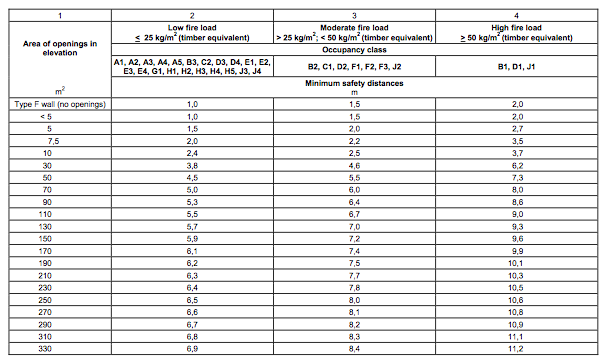 For ordinary “dwelling houses” where the area of elevation facing any boundary is not more than 7,5 m2, such safety distance may be reduced to 0,5 m.
There are several tables (five in all) that indicate requirements for compliance with “Presumed fire resistance of building materials and components”. 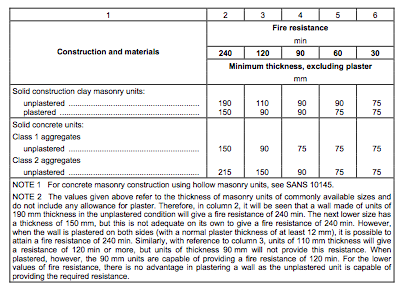 This table shows what is required for “structural walls”. 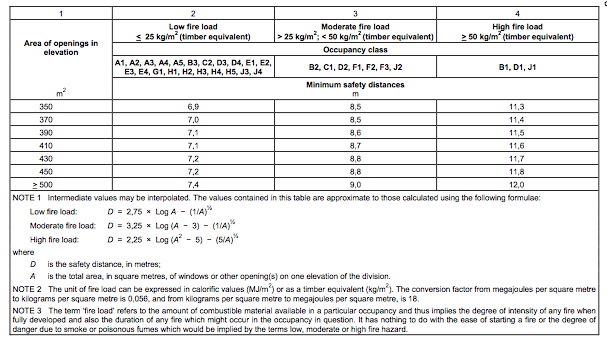 This table shows what is required for “non-structural walls and partitions”. The design requirements include the need for a competent person to ensure that the level of fire safety is adequate. This is particularly important in large and public buildings. 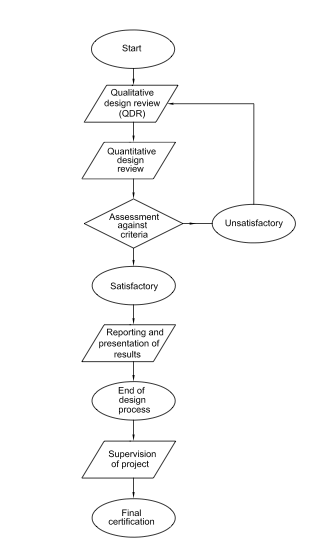 This drawing shows the basic fire safety engineering process. I work in a building where there are hidden smoke detectors ( above suspended ceiling). There are no markers or any indication where these “hidden” smoke detectors are or any indication below the ceiling that these detectors are functional. Is this correct or should there be some indication. shall be equipped with a fire detection system and alarm system that is designed, installed and maintained by competent persons in accordance with SANS 10139. NOTE 1 The term ‘fire detection system’ is used here to describe any type of automatic sensor network and associated control and indicating equipment. Sensors may be sensitive to smoke, heat, gaseous combustion products or radiation. Normally the control and indicating equipment operates a fire alarm system and it may perform other signalling or control functions as well. Automatic sprinkler systems can also be used to operate a fire alarm system. NOTE 2 The factors which have to be considered when assessing what standard of fire alarm, automatic fire detection or voice alarm or communication system is to be provided will vary from one set of premises to another. Therefore, the appropriate standard will need to be considered on a case by case basis. 4.31.2 All occupied areas within a building that exceeds 30 m in building height or contains any storey exceeding 5 000 m2 in floor area, other than a building contemplated in 4.31.1, shall be equipped with a category M and a category L fire detection system, and an alarm system designed, installed and maintained by competent persons in accordance with SANS 10139. 4.31.3 Any occupancy classified as A1, A2, C1, C2 or F1 shall have a manually activated visual and audible alarm system that is designed, installed and maintained by competent persons in accordance with SANS 10139. You might want to contact the department that deals only with Fire.